Nicole Russo has a Master's degree in Performance from the San Francisco Conservatory and a Bachelor’s degree in Performance and Education from the Crane School of Music, New York. She also completed her multiple subject teaching credential at SF State University. Nicole is an energetic person teaching students of all ages throughout the Bay Area. James Mitchell has been a formidable contributor to the Bay Area Jazz community for nearly 20 years. Growling up in Napa, he began performing at wineries, restaurants, and night clubs at the age of 15 years old. With an eclectic background in Latin, Afro-beat, Punk/Ska, Classical, and Bebop, Mitchell brings a colorful mix to Jazz standards and an incomparable high energy. He studied with legends like Pat Warren, John Simon, and Marilyn Thompson and earned his B.A in music from Sonoma State University in 2006. James has toured through both the U.K and the US. He is excellent with pupils of all ages. 'Phil studied Clarinet and Piano under the Royal School of Music in the UK, and played 1st Alto Sax with the prestigious Midland Youth Jazz Orchestra. He then proceeded to study Music and Performing Arts at University in London. After university he played in two successful bands touring the UK and Europe before moving to San Francisco to become a composer, songwriter and sound designer for theatre. Sean has been playing music for more than 13 years. Originally self-taught for a few years, he later began lessons with his local teacher while growing up in the mountains outside Chico, honing his own personal style of fingerstyle acoustic guitar. Since picking up guitar, Sean furthered his hunger for knowledge in music, and has since studied musical composition at San Francisco State University, writing music for a variety of ensembles. As an instructor, Sean has much experience, not only in guitar and composition/theory, but in piano, trumpet, trombone, drums, and bass, and has performed in a variety of styles and situations. 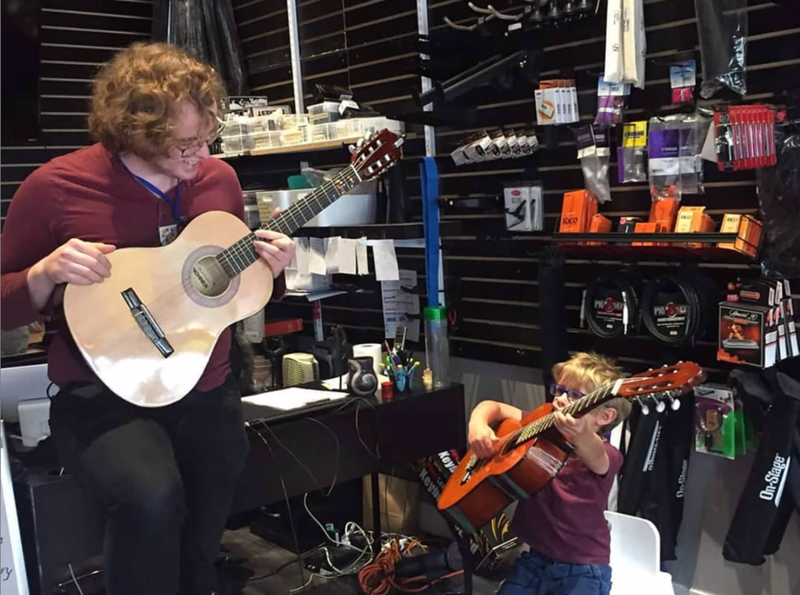 With all of this experience, Sean has learned that teaching kids their instrument is only the first step. Sean holds to the belief that each student should not only develop a familiarity with their instrument but be able to apply that familiarity to any situation. Ear training skills and theory are paired with a philosophy that one must always have their ears and mind open to the musical possibilities.